Immerse yourself in an enormous game world where the only limit is the one you create. Cubes Craft: Block Planet is a spectacular sandbox game that takes the full-fledged experience and puts it on the mobile platform so that players can enjoy it even when they’re on the go. This is a top notch game that has pretty much every single thing that this genre is known for so it’s definitely a great game to play whenever you have some time to spare. Cubes Craft: Block Planet is quite solid in most aspects but one area in which the game lacks is new player friendliness. If you haven’t played sandbox games before then you’re definitely going to struggle a little bit when you start off in Cubes Craft: Block Planet because there isn’t any tutorial sequence to ease newcomers into the game. Thankfully, sandbox games aren’t that difficult to get the hang of so, as long as you keep playing, you’ll get the hang of things on your own eventually. The gameplay of Cubes Craft: Block Planet isn’t anything groundbreaking or revolutionary but it has pretty much every single thing that we’ve come to expect from top tier sandbox games so it’s quite enjoyable nonetheless. In this game, you’ll be able to build entire structure, craft powerful new items, slay monsters, explore an enormous game world and do tons of other fun things. One thing that we really like about Cubes Craft: Block Planet is the fact that it’s really easy to gather resources so you’ll be able to progress through the tedious early game quite quickly and this is something that we definitely hope to see in other sandbox games as well because they tend to draw out their early game way too much. 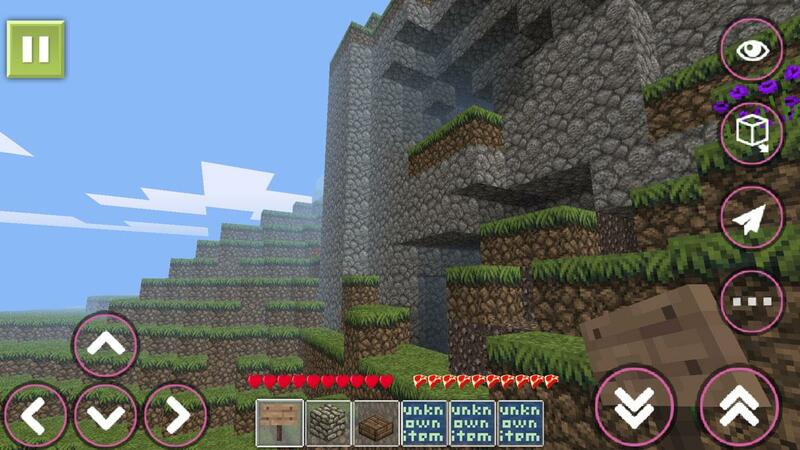 To make that the gameplay always stays fresh, Cubes Craft: Block Planet features two different game modes. The first game mode is the survival mode in which you’ll have to go against all the odds and survive in a game world that’s teeming with dangerous creatures who will try their best to take you down. The second game mode is the creative mode in which, as the name suggests, players can let their creativity loose and put together many amazing creations because there’s no limit to the amount of resources that they can utilize in their project. The visuals of Cubes Craft: Block Planet feature the same trademark voxel based art style that sandbox games have always been known for. The textures are very well detailed, the colors are bright and the animations are incredibly smooth so your visual experience is definitely going to be great. Cubes Craft: Block Planet is completely free to play so you’ll be allowed to play it as long as you want to once it’s been downloaded and installed. Overall, Cubes Craft: Block Planet is a great sandbox game that definitely fires on all cylinders.